Abstract: Battery-powered Internet-of-Things (IoT) devices achieve ultra-low power consumption by aggressively duty-cycling the operation of the system between ON and OFF states. However, the amount of power saving is usually constrained by two main factors: 1) the start-up time of the system; and 2) the OFF-state power consumption. The system’s start-up time is limited by the long start-up time of its reference oscillator, typically a high-Q, MHz-range crystal oscillator. The OFF-state power consumption is dominated by the sleep timer that is an always-ON 32KHz crystal oscillator. To address the mentioned challenges, we have developed circuit techniques and architectures that enables low-power clock generation. To kick-start high-Q oscillators, such as crystal and/or MEMS-based reference oscillators, pre-energization of the resonator through injecting energy for a precise duration is proposed. A universal analysis for energy injection into high-Q resonators will be presented and used to calculate the optimal injection duration essential to obtain a minimum start-up time. We will present that the proposed method ameliorates the sensitivity of the start-up time to the matching between the injection and resonance frequencies. Measurement results from a 65nm CMOS IC show that the proposed technique reduces the start-up time of multiple tested crystal oscillators to about 100-120 number of oscillation cycles, 15x faster than the best case reported in the literature while consuming the lowest start-up energy of ~12nJ. The second part of this talk focuses on developing an ultra-low power sleep timer that is based on a DC-only sustaining amplifier. New oscillator architecture is proposed that enables us to realize the most power-efficient sleep timer reported to date. Measurement results of 20 CMOS dies will be presented to show an average power consumption of 0.55nW for a 32KHz crystal oscillator. 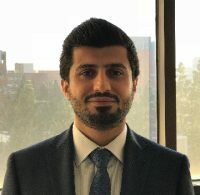 Biography: Hani Esmaeelzadeh is a PhD candidate in the Department of Electrical and Computer Engineering at UCLA. His current research interests include low-power analog, mixed-signal, and RF circuit design. From 2016 to 2017, he held an internship position at Qualcomm Technologies, Inc., San Diego, CA, where he was involved in RFIC design for cellular applications. Since June 2018, He has been with Movandi Corporation, Newport Beach, CA, developing RF/microwave circuits for 5G applications. Hani is a recipient of the UCLA Dissertation Year Fellowship during the 2018-2019 academic year, the UCLA Graduate Division Fellowship in 2014 and the Broadcom Foundation Fellowship from 2016 to 2017. He is also a recipient of the Broadcom Foundation Fellowship from 2017 to 2018. He has served as reviewer for the IEEE Transactions on Circuits and Systems I: Regular Papers and the Elsevier Integration, the VLSI Journal. He received the B.S. degree from the K.N. Toosi University of Technology, Tehran, Iran, in 2011, and the M.S. degree from the Sharif University of Technology, Tehran, Iran, in 2013, both in Electrical Engineering.